Definition at line 190 of file llmultigesture.h. Definition at line 381 of file llmultigesture.cpp. Definition at line 387 of file llmultigesture.cpp. Definition at line 409 of file llmultigesture.cpp. References mChatText, mFlags, TRUE, LLDataPacker::unpackString(), and LLDataPacker::unpackU32(). 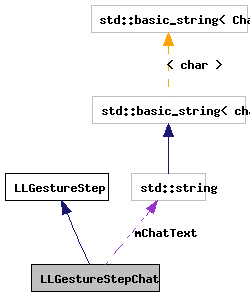 Definition at line 424 of file llmultigesture.cpp. References llendl, llinfos, mChatText, and mFlags. Definition at line 417 of file llmultigesture.cpp. Definition at line 390 of file llmultigesture.cpp. Definition at line 196 of file llmultigesture.h. Definition at line 402 of file llmultigesture.cpp. References mChatText, mFlags, LLDataPacker::packString(), LLDataPacker::packU32(), and TRUE. Definition at line 207 of file llmultigesture.h. Referenced by deserialize(), dump(), getLabel(), LLPreviewGesture::initDefaultGesture(), LLPreviewGesture::onCommitChat(), LLPreviewGesture::refresh(), LLGestureManager::runStep(), and serialize(). Definition at line 208 of file llmultigesture.h. Referenced by deserialize(), dump(), LLPreviewGesture::onCommitChat(), and serialize().